Tatiana Classic Chocolate brings you the essence of rich chocolate in a traditional 6x44 Lonsdale vitola. Did not like it, not enough chocolate flavor. Other tatiana flavors I hade were good. not what i excepted .. Very nice smoke. Mild cigar to wind down after a robusto or other full bodied smoke. Nice flavor and mild smooth burn. Been smoking cigars for 25 years, and this is the most comforting cigar I have smoked. Great with a cocktail or two. I got these based on wanting to try a different flavored cigar and also the review saying they were good. I was not very impressed with it. I didn't care for the flavor as there wasn't much and the draw was just off. I can say that I have only smoked one of these thus far but my first impression wasn't very good. nice cigar for the price! I've been an cigar smoker for many years and try to get my friends into this obsession. Not into flavored cigars at all, but? This is actually a good smoke for the price and actually got my friends into my world of smokey enjoyment.Thank you Tatiana and BCP for a good Cig and price..
Great cigar for people who like chocolate. Thumbs up. Shipped quickly amd best price around! 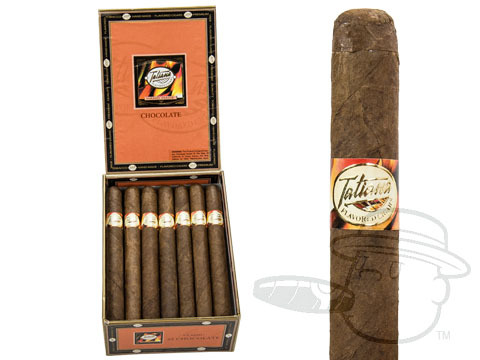 The Tatiana Classic Chocolate cigars are my favorite! They smell great and taste great! My husband Loves this flavor. It is smooth and doesn't smell and when he smokes it. Highly Recommended and great price with fast delivery. I get the 5-paks of diff. flavs. Never broken or dry. My wife & I enjoyed the flavor of this cigar. The draw was great as well. Tatiana Classic Chocolate is rated 4.3 out of 5 based on 35 customer ratings.